Availability of this title may vary. Please email or call for price. In this deeply personal book, the celebrated Haitian-American writer Edwidge Danticat reflects on art and exile, examining what it means to be an immigrant artist from a country in crisis. Inspired by Albert Camus' lecture, "Create Dangerously," and combining memoir and essay, Danticat tells the stories of artists, including herself, who create despite, or because of, the horrors that drove them from their homelands and that continue to haunt them. Danticat eulogizes an aunt who guarded her family's homestead in the Haitian countryside, a cousin who died of AIDS while living in Miami as an undocumented alien, and a renowned Haitian radio journalist whose political assassination shocked the world. Danticat writes about the Haitian novelists she first read as a girl at the Brooklyn Public Library, a woman mutilated in a machete attack who became a public witness against torture, and the work of Jean-Michel Basquiat and other artists of Haitian descent. Danticat also suggests that the aftermaths of natural disasters in Haiti and the United States reveal that the countries are not as different as many Americans might like to believe. 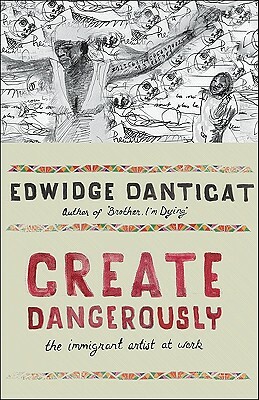 Create Dangerously is an eloquent and moving expression of Danticat's belief that immigrant artists are obliged to bear witness when their countries of origin are suffering from violence, oppression, poverty, and tragedy. Edwidge Danticat was born in Haiti in 1969 and moved to the United States when she was twelve. She is the author of two novels, two collections of stories, two books for young adults, and two nonfiction books, one of which, Brother, I'm Dying, was a finalist for the National Book Award and winner of the National Book Critics Circle Award for autobiography. In 2009, she received a MacArthur Fellowship.